Big Smoke Miami attendees were able to smoke cigars and drink premium libations into the night on the Fontainebleau Hotel's patio. The crowd came early and stayed late, eager to be part of the first Big Smoke in Miami in nearly 20 years. It was a night of cigars, great cocktails, a festive atmosphere and some of the biggest names in the premium cigar business. Held at the luxe Fontainebleau Hotel on Miami Beach on Friday, April 7, the event drew hundreds of eager cigar lovers not only from around Miami, but from the New York area, other parts of Florida and the United States, and even from Toronto, Canada. "The Miami Big Smoke was a smashing success, and I'm 100 percent in for next year," wrote cigar star Jonathan Drew on Twitter. 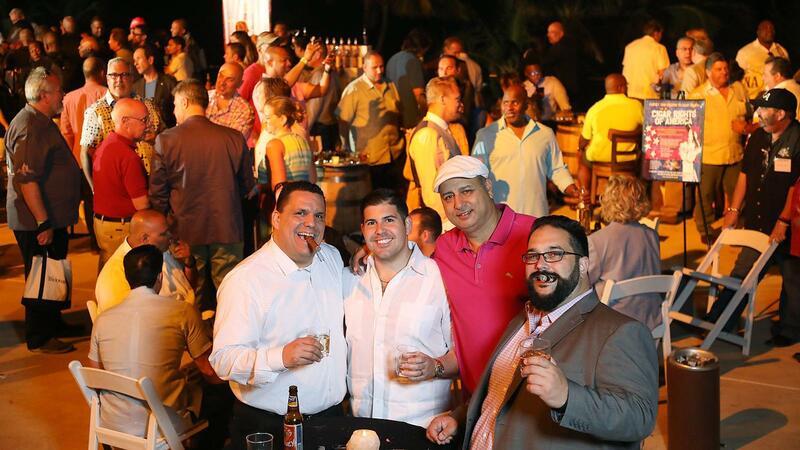 "The biggest cigar event in Miami," said Rafael Nodal of Aging Room cigars. The bartenders were kept busy by the thirsty crowd, mixing drinks from the Bacardi library of brands. There was a D'Ussé Cognac Lounge, the John Dewar & Son's Fine Scotch Emporiums, Hatuey Beer and Bacardi 8 aged rum. Specialty cocktails included Bacardi 8 Old Fashioneds, D'Ussé Sidecars and The Penicillin made with Dewar's. The format was different from other Big Smokes. The audience walked into the main ballroom, which was filled with cigarmaker's booths, two full-sized bars, a spread of fine food, a stage with a live band, and seating areas. After getting cigars from each station—a ticket entitled you to 36 smokes—you could walk outside to the vast patio overlooking Miami Beach and palm trees for a cigar. The patio also had several bar stations, and the drinks flowed all night. Those who wished to break up the evening could move back and forth between the patio and the inside room (so long as they didn't bring a cigar inside, where smoking was not allowed). The event went long into the night. Cigar stars on hand at the Big Smoke included: Carlos Fuente Jr. of Arturo Fuente Cigars; Jorge Padrón of Padrón Cigars; Litto Gomez of La Flor Dominicana; Rocky Patel, Nish Patel, Nimish Desai of Rocky Patel Premium Cigars; Ernesto Perez-Carrillo, Lissette Perez-Carrillo and José Blanco of EPC Cigar Co.; Manuel Quesada of Quesada Cigars; Pete Johnson of Tatuaje; Janny, Jaime and other members of the Garcia Family from My Father Cigars; Alan Rubin of Alec Bradley Cigar Co.; Nestor Andres Plasencia of Plasencia Cigars; A.J. Fernandez of AJ Fernandez Cigars; Jonathan Drew and Willy Herrera of Drew Estate; Javier Estades of Altadis; Rafael Nodal of Aging Room; Christian Eiroa of CLE Cigars; Michael Herklots of Nat Sherman; Bill Paley, Clay Roberts and Sam Phillips of La Palina; Chip Goldeen of Ashton Distributors; Régis Broersma of General Cigar Co.; Steven Bailey of Cornelius & Anthony Cigars; Erik Espinosa of Espinosa Cigars; Jochy Blanco of Tabacalera Palma; Paul Palmer-Fernandez of Casa Fernandez; David Wagner of Oliva Cigars; Jason Carignan of Ventura Cigars; Jason Wood of La Aurora Cigars; Kevin Newman of El Artista Cigars; Mehul Shah of MBombay Cigars; and Edel Gomez representing Micallef Cigars. The next Big Smoke takes place in Las Vegas on November 17-19. To order tickets, click here.